Annuals have a short but prolific life—they exist to grow fast and lush for one glorious growing season, remaining in bloom for most of their fleeting lives. They are a fantastic way to fill holes and add color around your lake house—whether in window boxes, hanging baskets, or planted around the garden to add a splash of color for those lulls between the perennial blooms. Most annuals need very little attention beyond some fertilizing when planted, and regular watering. Some annuals are even self-cleaning, meaning they drop their spent blooms without you having to deadhead them. Begonias, long a popular favorite annual, come in a wide variety of shapes, colors and sizes. Wax begonias grow quickly, are deer resistant and do well in full sun, although they do like a bit of shade in high temperatures. They prefer moist, not wet soil. With their shiny leaves available in a range of colors from rust to green, wax begonias also have blooms in various colors that can be single or double blooming. They can grow from six to 18 inches tall and spread six to 12 inches wide, making them an easy fill for window boxes and container gardens. Tuber begonias are slightly more delicate than wax begonias, with larger leaves and showier blooms that prefer dappled sunlight. 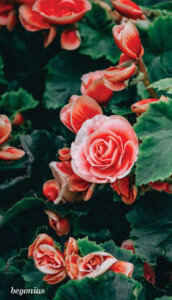 Although begonias are known as annuals, they can be brought inside during the winter, and their tuberous roots can be stored for planting the next spring after their greenery has died off for the year. Impatiens, another low maintenance annual, prefer shade, but can be planted in sun if they are allowed to acclimate to it. The closer they are planted together, the faster and taller they will grow to form a bank of flowers. Impatiens are a self-cleaning plant that bloom profusely all season without needing to be deadheaded. Like begonias, they are great for borders, bedding plants or in containers. 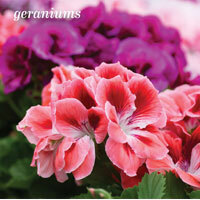 Geraniums do well in full sun, while also being able to handle some shade. Unlike impatiens and begonias, they will need to be deadheaded, but as their blooms grow on stalks that are easily pinched off, it’s a simple task. While there are several types of geraniums, including wild ones, the most popular and well-known geranium is the zonal geranium, also known as the common or garden geranium. Their easily recognizable tall-stemmed flowers with ball shaped blooms come in a wide range of hues—red, white, pink, coral, lavender and yellow—that may also be bi-color blends. Their distinctive round-to-kidney shaped leaves may or may not have a dark circular mark on them, and they add a cheery vibe to window boxes and other container gardens. Some annuals, such as nasturtiums, zinnias, cosmos and sunflowers, are easily grown from seed. Nasturtiums have distinctive round leaves and are often planted near vegetable gardens because they are pest resistant while also being edible, although they can also be found in container gardens. 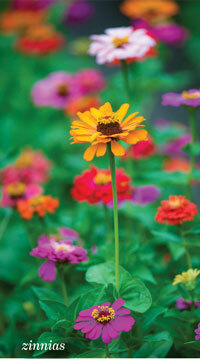 Zinnias, cosmos and sunflowers are all better suited to garden beds than containers. They come in a variety of colors and heights, and attract beneficial pollinators such as hummingbirds and butterflies to your garden. Zinnias and cosmos are often planted as ‘cutting flowers,’ so they offer the added benefit of keeping your home supplied with fresh cut blooms throughout the season. 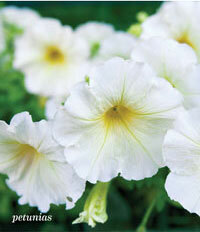 Of course, no talk of annuals is complete without mention of classically popular petunias. These prolifically blooming trailing plants love full sun (though during the heat of mid-summer they do appreciate a bit of shade, as extreme heat can cause them to pause in their blooming). Available in an ever-widening array of colors and sizes, old fashioned varieties need regular dead-heading in order to keep blooming, while newer hybrids are far less fussy. Regular fertilizing helps keep them blooming, but too much water can make the plants leggy. They do well in hanging baskets or as a trailing plant in a container garden. While Boston ferns are typically thought of as the classic plant to have in hanging baskets on the front porch, the truth is, they prefer indirect light and lots of moisture. They are most happy on a screen porch where they can avoid the direct heat of the sun. Sweet potato vines are an excellent trailing greens that grows like gangbusters in the heat of the summer. 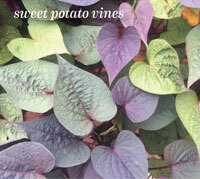 While they do produce small edible tubers, as their name suggests, they are not actual sweet potato plants— these are bred to have colorful foliage that comes in shades of purple, pink, green, variegated, and more. They like full to partial sun and moist soil. Coleus are perhaps the lowest maintenance plants of all annuals. They are known for foliage which can be spotted, splashed or bordered, in shades of red, pink, purple, white, yellow, green and chartreuse. Additionally, leaves can be wide, thin, round, pointed, ruffled or straight-edged in shape and size, making for an amazing array of options. Coleus will send up some spiky blooms that can be removed, but their main attraction is their foliage. There are varieties that do well in full sun (typically darker leaved varieties) and those that do better in partial shade (lighter leaved varieties). They can be compact, trailing or upright. Members of the mint family, they are tropical plants that can be propagated to grow inside during the winter, as long as the conditions it prefers are met (temps of 70 degrees and fairly humid). 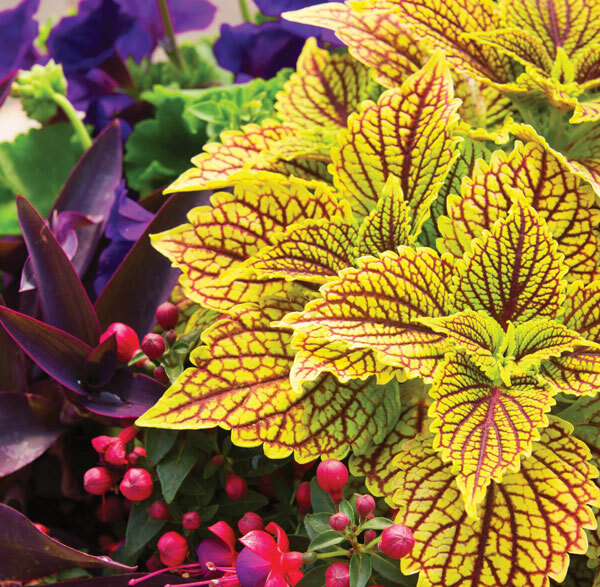 New varieties arrive on the market annually, making it possible to plant coleus every year, but never the same one twice.